Back in the summer of 2011 I was contacted by the design team from the Performance Running division at Skechers to see if I wanted to try out a new shoe that they had developed. The shoe was the original Skechers GoRun, and it was the first offering from the Go team at Skechers. I reluctantly agreed to try the shoes (I had previously had some negative experiences with the company), but wound up being impressed by them. They were light, flexible, and had one of the best uppers I had ever put on my feet. Since then, I have developed a close relationship with the Skechers performance running design team, and have helped them fine tune a number of shoes that have come out since (Go Bionic, GoTrail, and several more in development). I should emphasize that I have done this on an entirely voluntary basis, having accepted no payment other than the shoes that they provide for me to test out. The original Skechers GoRun was a shoe that people either loved or hated (read my GoRun 1 review here). I know quite a few people who tried them on and immediately were turned off due to the pronounced “bump” under the midfoot. The shoe was designed with an unusual sole that was actually thicker in the midfoot region than in the heel or forefoot. Combined with a pronounced sole rocker, this made it feel as if you were rocking backward off the shoe when standing in them, and I found them uncomfortable to walk in. However, once I got running in the GoRuns the sensation went away. I know a bunch of runners who are big fans of the shoe. In early discussions regarding the update to the GoRun, Runblogger columnist Nate Sanel and I indicated that if Skechers wanted to make inroads among serious runners, the midfoot bump sensation would have to be reduced. The design team agreed, but also didn’t want to completely remove the bump since many people who were fans of the original liked it because of the unique sole design. The compromise was a shoe in which the bump sensation was reduced, but not completely eliminated. That is probably the biggest change that appears in the GoRun 2. I was shipped the first version of the update to the original GoRun last summer, and subsequently ran in a series of iterations of the GoRun 2. The most obvious thing I noticed in the first GR2 prototype was the reduced midfoot bump. I could now stand and walk comfortably in the shoe, but there was still a sensation of greater sole thickness in the midfoot area. I was totally satisfied with the compromise. The upper had been changed a bit, but it was still soft and stretchy and felt great on my feet. There was one exception though, and I had been warned of this by Skechers before I got the shoe – the overlays on the sides of the shoe had been built incorrectly at the factory (apparently this kind of thing is not uncommon). They were a heavy plastic material – rather inflexible and hard (you can see it on the shoe below). I had two additional issues with the first iteration of the GR2. First, I was experiencing impingement and irritation from the seams at the bottom of the lace-row. A decision was made to move the forefoot seam at the base of the tongue back a bit, and the seam extending from the outer lace-row down the lateral forefoot was eliminated. This solved the abrasion issue for me, but I have heard from a few people who are still experiencing problems in this area (likely a foot-shape specific issue I’d guess). The second issue that both Nate and I experienced was a distinct feeling of pressure under the central forefoot from a rubber “sensor” that was added in that area. It got to be irritating after a few miles, and after we both commented on the problem the rubber patch was eliminated (see photos below for the before and after versions of the sole). Skechers GoRun 2 – final production sole (top) and first iteration sole (bottom). Note the rubber lug in the center of the forefoot that was removed in the final version. We probably went through 4-5 versions (at least that I was involved with) before arriving at the production model. Most of the big issues were caught after the initial iteration, but small tweaks to things like forefoot width were made as the final version was honed in. The result is a shoe that I have come to love, perhaps since I spent so much time with it over an extended period of time. The production Skechers GoRun 2 is in my opinion one of the best distance shoes I have worn. I’d put it right up there with the Saucony Kinvara, A5, and Virrata (and maybe Brooks PureCadence 2) as a contender for the shoe that will be on my feet this spring when I run the Vermont City Marathon. The sole has a softness and flexibility that I really enjoy over long distances, the upper is once again fantastic, and though it is a tad narrower in the forefoot compared to the original GoRun, there’s still plenty of room for my feet and the stretchy upper makes it even more accommodating. To emphasize once again, since this will be the most frequently asked question, the midfoot bump is still present in the GR2. However, it is markedly reduced, and for me it has essentially become a non-issue. I’ve spent entire days wearing this shoe, and have run quite a lot of miles in the various iterations, and never once did I feel any discomfort from the sole contour. For technical specs, the production GoRun 2’s weight in at 6.7oz in my size 10 (weighed on my own scale), and the sole dimensions are 11mm forefoot, 20mm midfoot, and 15mm heel. This is 1mm thicker at each point than in the original GoRun. Although the midfoot is still thickest in the GR2, the bump sensation was reduced by reducing the sole rocker/curvature and reducing the prominence of the arch support. Due to the change in the sole rocker, you don’t get the same sensation of falling back on the heel when standing in the shoes, and the heels don’t feel like they are bottoming out when you walk in the shoes. I have to admit, being able to take part in the design process for a running shoe is quite a cool experience. As I write this, a commercial for the GoRun 2 just appeared during the Super Bowl. To think that a product I was able to provide input on would show up in front of such a large audience is a bit humbling (and to give credit where it’s due, I played only a very small role – Kurt, David, and Kathy at Skechers did all of the hard work!). Blogging has taken me places I never could have imagined just a few years ago! If you have any specific questions about this shoe, I’m happy to address them in the comments! 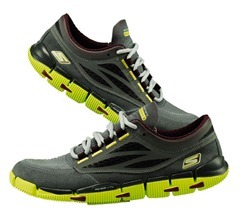 The Skechers GoRun 2 can be purchased at Zappos , and also Shoebuy.com (Use code SHOEBUY for 10% off). 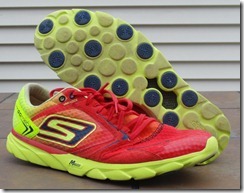 For another take on this shoe, view the Skechers GoRun 2 review on Believe in the Run. Did you help with the commercial too? I loved it! I got the Go Run 2s last week and LOVE them as a fast, lightweight, flexible running shoe. Never had the previous version. This one is a winner! Thanks for working with the Skechers development team. You guys got it right. Very interested but I keep reading they run narrow. As a wide footed guy I am a little nervous, but I did just order a pair to try. I hope Skechers will soon submit their shoes to Shoefitr, so I can compare them with other shoes in my line-up and find out what size would suit me best. I also have wide feet and a lot of shoes are not wide enough for me, unless I order them more than 1 size larger. But then length and heel fit becomes a problem. Skechers performance shoes almost aren’t available in shops here in the Netherlands (I think there are 2 or 3 Skechers stores nationwide and they aren’t close to the place I live), so I have to order them online. What shoes do you typically wear? If I have them I can give you a rough comparison of width. For example: I’ve also tried the Grid type A5 in size 12, but even then the platform wasn’t wide enough. I’d say the platform is a tad narrower than the GR1, much narrower than the Bionic, but the upper is stretchier on the GR2. Might be a case where a try-on before purchase is warranted. To give you some background, I’m a 8-2E in New Balance and a 8.5 in the Adipure Gazelle’s. I tried the GoRun2 in 8 and I found it too narrow for my tastes. Also tried it in an 8.5, but the shoe length was too long. I wouldn’t call them narrower, just a bit narrower than the original. The upper is very stretchy and accommodating. Damn! Why they change anything that works? i have about 30 miles i mine, and it’s one of my favorite shoes ever. well done on the design help, Pete! Besides the GoRun and Bionic, I also like the GoRun Rides for longer runs. QUESTION = How different is the GoRun 2, when compared to the GoRun Rides? Can’t wait for the GoRun 2 to be available in Indonesia. I’ve also just finished reading “Tread Lightly,” great book! Pete, thanks so much for the review- awesome as usual! 2 brief questions: how do they perform off-road or in wet/slippery conditions (ie snow/ice/winter running)? And along the same lines, any experience with how they hold up if they get wet? Traction is decent, certainly not lugged enough for hard trail work, but the lack of smooth rubber tends to lend itself well to wet conditions. I don’t think I’ve soaked them on a run – they do have an integrated footbed that may soak up some water, but this version also comes with a removable insole so there is the option to have a less absorbent surface underfoot. Forgot to mention the insole in the post. Is that correct that the sole thickness in the forefoot is half a mm less than the GoBionic (according to your review of each)? I wear the GoBionic about every other day and I wouldn’t have guessed that from the limited trial I had with the GoRun 2. Maybe it’s just the heel I find so thin on the Bionics. Regardless, the GoRun 2 are on my want list. Interesting story Pete. Must be so cool to help design a shoe. I am very curious what your Vermont shoe will be. I saw the Virrata is among the possibilities after a few runs already! Does it beat your A5? Great review and I’m loving Skechers too. Do you use GR2 with or without the footbed? In my first pair, the footbed in my right shoe slipped around a bit and quickly (~25 miles in) settled in a spot so that the front of it was a couple centimeters from the end of the shoe (and the back was bunched up around the heel) which made the tips of my toes overlap the footbed. It’s pretty uncomfortable and drives me crazy. The local store swapped them out as a defect, and my second pair is having a similar issue but on the left shoe. Does the footbed do anything or should I just pull it out? Also, GoTrail is currently my favorite trail shoe (>200 miles on my first pair in about 6 weeks). The insole is optional, you can take it out. I use it, have not had bunching issues but I know others have. Same thing happened to my pair. Just the right shoe, though. Annoying as heck. just bought a pair of Bionics and found them to have almost no cushion in the forefoot. i usually wear the Kinvara 3s, but had to retire them due to torn uppers. since you’re comparing these to the Kinvara 3s the cushioning on these on par with them? i was gonna return the Bionics anyway. should i grab a pair of these instead? The GR2 is much more cushioned than the Bionics, I’d compare it to the Knvara. i see. that’s a little hard to believe since the kinvara 3s have 19mm in the forefoot vs the GR2’s 11mm. but i trust your judgement. The reason I think is that the GR2 is a softer shoe so cushioning feel is greater to me. I find that the numbers don’t tell the whole story with cushioning – firmness is very important as well. There’s also the issue that forefoot stack depends on where exactly the measurement is taken and how quickly it thins out toward the toe. Off topic, but since marathon shoes were mentioned… would or has anyone run a marathon in Nike Free 3.0? They feel great but I haven’t taken them on that kind of distance yet. I’m looking for a marathon shoe. Forget it, I can’t get a good fit in the Free 3.0 and am returning them. I may look at the GoRun as an option. I love the Bionic as a calf workout and to help focus on good form. Fit was my issue with the new Free 3.0 – way too narrow. That and the lack of breath ability. The Skechers are far superior. If they feel good and cause no trouble, I don’t see why not. I am one who did not like the GoRun (original). I don’t like shoes that mess with my foot placement and these made me run much further on my foot than I do, causing leg issues. I love my Kinvaras! Hi Pete, further to reading your review I bought a pair of the GR2. They’re indeed a tad narrower than my Bionic. I like the feeling of that smaller mid bump. I bought them for runs over 20ks due to the added cushion compared to the Bionic. If all goes well I will run the Ottawa marathon in them. Thanks for the great review! No problem, hope they work out! I have 4 pairs of the original GoRuns. 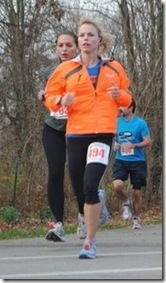 I love that I was able to get them in E width… something unheard of in a woman’s minimalist running shoe. I also loved the hump as it provides arch support I need to keep plantar fasciitis at bay. I was very disappointed when I heard from the company that they had no plans to produce the GoRun2 in wide widths. They had already skipped wide in both the Bionic and Ride. I guess that as a 2nd class citizen, I will just continue to stockpile the originals and hope that someday a designer with wide feet will be invited onto the design team. edited to add that I wasn’t referring to you, Paul 🙂 I’m just a little bitter after leaving one too many “specialty” running stores in total frustration. The first time I put on a pair of GoRuns was like opening the gates of heaven! Wow, those look not just nice but like solid running shoes. Peter, what do you think of the theory that this shoe is really a 9mm drop shoe since we should measure from where we land, ie midfoot, to forefoot? Because the sole is rockered and very flexible, it tends to push the midsole in the midfoot up into the arch so the heel and forefoot probably rest at the 4mm differential. That’s why there is the sensation of a midfoot bump in this shoe and not a more pronounced ramp-like effect as in a shoe with a firmer, less flexible sole. Pete, interesting to read about the development of the GOrun 2. Sad to hear that conformance to convention killed the magic that was inherent in the original GOrun with the hump. By removing the hump in the new GOrun 2, it becomes a conventional shoe. Ironic, Pete, that you choose to recommend Skechers make a running shoe (the GOrun 2) feel more normal when standing or walking. The result is that the GOrun 2 is unremarkable and just another run of the mill semi minimal running shoe. Sure the original GOrun with the hump in the middle felt weird when standing and walking, but it is a running shoe! Not a standing and walking shoe! The original GOrun was revolutionary, a brave departure from the industry norm on Skechers part. It was truly out of the box. The modifications resulting in the GOrun 2 have put it back in the box. The story of the GOrun 2 reminds me of the Adidas Feet You Wear line of running shoes back in the 1990’s. Adidas used some shoe design principles espoused by biomechanics scientist Dr Nigg – such as a laterally convex sole allowing the foot to naturally roll and pronate like a bare foot. The Adidas Feet You Wear shoes were revolutionary and worked amazingly well for running. Unfortunately, they felt weird when standing, walking or trying them on in the shoe store. They were not big sellers and Adidas quickly went back to selling cushioned bricks. Fact of the matter is that a lot of people absolutely hated that bump in the GoRun, and I’ve heard from many who didn’t even like it when running in the shoe. Was it out of the box? Sure. Was it beneficial? Maybe, maybe not and probably depends on the person. I for one like the shoe a lot more without the bump, and I gave them my honest opinion. Pete, I’m glad you gave them your honest opinion. I for one can feel the midfoot bump in the GR2 and I like it, but I don’t think I would if the bump was any bigger. The shoe is awesome! Keep up the good work! I will add that though I did have a lot of input on the GR2, I did not with the Go Trail. I wore a few iterations of it and gave my feedback, but design decisions on that one probably came from their more trail oriented wear testers. Peter, I just finished my first run (5) in these and I have to send you a big thanks! I was skeptical, but loved them. I log most of my miles in NB 730s and 1400s, but I’ll be switching to these. Great job! Hi Pete, I ordered a pair of these based on your review. I’ve been looking for a replacement for my Kinvaras since they started to develop tears in the upper. I’m pretty happy after my first run today. The only thing I’m missing is a bit of arch support: the midfoot bump doesn’t seem to help as it’s the same height both sides of the foot. But these shoes sure feel fast! You could try swapping in an insole from another shoe that has a bit more arch support. Glad you like them! I purchased these and a pair of go bionics based on your reviews. So far in 2 weeks I have logged over 100km (60miles) in the GR2. I have had to take the inner sole out as they appear to run a little narrow for me. Might need to go a half a size up next time. So far I’m loving them. Most of my mileage has been in the inner city, so roads and footpaths with the occasional trail running. My only criticism is how quickly they’re wearing in the forefoot, especially where I toe off, (between to 2 medial dots!). I’m not sure ill get my normal 6 months or 500miles+ from them. I loved the GoRun original, I bought 2 pairs last year when I was training for a half and they worked very well for me. It is time for a new pair and I am unsure whether to go with the old GoRun or try out the new GoRun2. What is your opinion? For someone that didn’t mind the bump do you still prefer the Go Run 2 better? Thanks for your input! Great article. Thanks! If you liked the feel of the original, you can get those much cheaper now so maybe stick with them. The sequel has less of a bump feel, so may not feel exactly the same. I guess it depends on how much of your liking for the shoe was because of the bump. Just tried the women’s version this morning. First impressions? Love the fit, which is snug at the ankle, yet wide enough for my duck feet in front without being so roomy I’d need a thicker pair of socks to fill in the space above my foot. In addition, the arch is located perfectly and the shoes are comfortable enough to walk in, if I end up in my running garb all day. I haven’t compared these by weight with my current faves – Merrill Barefoot and Inov-8 Road X-Lite – but they feel light, almost springy and weathered light rain and a muddy, groomed trail as well as the road. Can’t wait to take them out on a longer run. Hello Pete, I enjoy running in the Kinvara 3 and also the Type A5, and I’ve noticed that you also like these shoes. Thank you for the review. I’m thinking buying a pair. Are the Go Run 2’s true to size? In the Kinvaras, I’m wearing 10.5, and in the Type A5 11. Would a size 10.5 in the Go Run’s be recommendable? I wear the same size in the Kinvara and GoRun 2, and half size up in the A5. I think your Kinvara size should be fine. As always, a very interesting review Pete! One question regarding the sizing of the GR2: given the narrower platform of this shoe compared to the Go Bionic, should I go a half-size bigger? I own the Go Bionic in size 10 (US). Thanks! I do not, same size in the GoRun2 as in the Bionic. Hi Pete, how would GR2 compare to the Ride? I truly LOVE the GE2 but for the cushioning in the forefoot, as I am battling an on-and-off turf toe on the left foot and would prefer a cushy ride in that area. Is there anything I can drop into the forefoot area if I were to get the GE2 though? Plus, I am currently just starting on mid-foot running and had success using the Pure Cadence for about 8 months. Which would be a similar experience? The Ride is a bit cushier than the GR2, but I honestly have not run in it much as I love the GR2 so much and the Ride is just a bit too much shoe for my taste. For great forefoot cushion, take a look at the Saucony Virrata. Much thanks for the recommendation! However I realize the Virrata is a Zero drop and I’m not certain I can handle that yet; maybe a 4mm. Can you recommend another that is similar to the GE2 but with more forefoot? The Ride may also be worth a shot if you like the GoRun, similar feel, more cushion. They are both very flexible, so might help with foot slap. I have a runner in my beginner 5k group who is having shin splint issues I think because of foot slap and I’m going to try the GR2 and Bionic and see if they help. I went with GR2. Wore them once already. Big difference from the Brooks Beast I was wearing. I’m sure my size will wear them down rather quickly, but I like them so far. Working new lower leg muscles too. If coming from the Beast, transition slowly. You can even mix the two shoes up on alternating runs as you transition. Let me know how it goes! I just got a pair of GoRun 2’s and after 1 run they jumped into the lead as most likely to be worn at VCM in a month. I’ll try them on an 18 miler this Sunday. The super flexible sole is great but to me the best part is the upper–it’s like a sock. I’ve had a sore spot on the top of my foot and could not even put on most of my lightweight trainers or racers. In the GoRun 2’s I don’t feel it at all. Do you remove the insoles or run with them in? I wore them for the first run, might try removing them. I keep the insole in since I tend to get abrasion under the ball behind my big toe when I remove it. I was skeptical of the shoes, but ended up buying a pair over the weekend. I was wrong, the shoes are fantastic. Thank you so much for the great review and opening my eyes to a great product. No problem Drew, glad you like them! I’m not familiar with that Adidas shoe so can’t compare. I recently discovered this great review and bought a pair of GR 2’s at my local Shoe Carnival a month ago. I’ve probably put close to 6o miles on them and they are the most comfortable running shoe I have worn. I’m so impressed that i went back to Shoe Carnival and used my buy 1 get 1 1/2 off option to get another pair for under $40.00. Unfortunately, they do not carry the Go Bionic so I am wondering if you can give me a fit comparison. Thinking about ordering a pair off Amazon where they are pretty cheap. I wear same size in both, but the fit in the Bionic is a bit wider in the forefoot. Thinking about getting the GoRun 2s. Pete, what’s the difference between the GoRun 2s and the GoRun 2 Supremes? Also are these meant to be worn without socks? Hmm…no idea what the GoRun 2 supreme is! I must say that I am taken back by the now narrow fir of the Go Run 2. I can’t wear the new version. I also rather enjoyed the bump in the old version because that meant that i could go insole-less! Having significant foot problems ($400 doc prescribed insoles) and being in the military, I’ve got to be able to run. I guess I’ll buy up some if the original Go Runs. P.S…I’m returning the new version after a less than comfortable performance. Sketchers should market their original version to folks with screwed up feet like me!!! Thanks for an in-depth review! Have you tried the GoRun Ride? It has a wider fit. 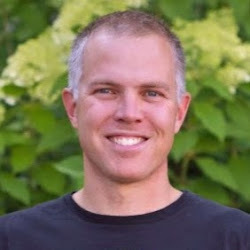 Hey Pete – I bought a pair of GoRun2 and I LOVE them – they feel like butter and I can’t imagine putting anything else on to run with BUT unfortunately I am getting blood blisters on the balls of my feet on my right foot, regular blister on my left which whatever. I have running non cotton socks and use gold foot powder. I think it is the shoe so what can I do? I am not used to minimalist, went from Brooks to these so is that the problem, can I put some kind of insert in? I don’t want to switch but I haven’t been able to run since Sunday and it is killing me! If you are unsure is there anyone at Sketchers I can talk to? I am that in love with these shoes that I don’t want to give them up! 1. Try swapping in a different insole from another shoe, maybe your Brooks and see if it makes a difference. 2. Try a double layered sock like Wrightsox, they can help with friction. Hi Pete! I hope you can still read this coz the comments are several months old already. Btw, congratulations, and a great review of the Go Run 2, as with all your other reviews. Im planning to order these online tomorrow and not quite sure of the sizing. I have an old merrel trail glove size 9 US which, fits just a wee bit tight (which is good for the trailing, I suppose). Is It safe if I go a half size larger than the TGs? Oh and I’m also considering the Saucony Virrata, which I think I really have to go half a size up if ever. Thanks! Definitely size up in the Virrata, GoRun 2 fits a bit large so same size as the TG might be fine. It has a stretchy upper so is accommodating. Originally started using the GORun 1 back in early June and have since put in 486 miles so recently I started looking to replace it. Spent hours pondering whether to go with the 2 or stick with the 1 that I know and love. Found this article as a result and realized that the feel of the original seems to be much less pronounced in the 2. I think a lot of people still demand the 1 as its still widely available on Amazon. In the end I ordered two pairs of the original. I feel as though the 2 has made too much of a compromise in attempting to be more mainstream. Hopefully the 1 will still be available when these two pairs wear out!! Morning I was not even aware of these shoes and always ran in Asics Nimbus or cumulus but after a seminar and a great man actually cutting my shoes so they were so rigid finally after a month went and bought a pair of Go Run2. After 30 km’s training I returned to the shop and bought another for stock. I am seriously impressed so far few more K’s then I will be totally convinced. A little concerned about Ultras especially in South Africa we have 2 Oceans 56km and Comrades 87 Km. I suppose trial and error. Still persevering in the gorun2 but seems to be giving me painful knees, not while I run but during the day for a while at odd intervals. In the day I do however where my older trainers that I used to run in. Any suggestions as I am very happy with the feel but a little concerned will be running a marathon in 2 weeks. If the pain is in your casual shoes, maybe try a different casual shoe? I’ve experienced that pain in the knees and have found it to be caused by worn out shoes. In your case if your used trainers are worn enough along an edge to cause your tibia to lean more in or out than your regular shoes it can cause knee pain. I have one pair of go run2 and just got a pair of go run ultra. I’ve been wearing asics kayano with which i have run my 1st marathon in february (Sevilla). Do you have any kind of recommendation for the transition from a high drop and cushioned shoe to a minimalist shoe like go run 2? Mainly just mix them in gradually on shorter runs and let the body adapt. It’s not a problem to mix shoes up on different days, and always best to be careful when moving to a very different shoe. The Ultra has plenty of cushion, but is much softer and more flexible than the Kayano. The GR2 less cushion, even more flexible, so very different shoes. Progress slowly with shorter runs in the new shoes and you will hopefully avoid issues. Hi, thx for your review Peter. I have a very basic question, I’m a light overpronation runner, and I’m used to run in Asics 2160, do Skechers have a shoe for me you think? or is the overpronation issue not present when running mid foot/for foot ? Unless you have an injury history specifically linked to your pronation, I wouldn’t worry about it. The Skechers GoRun Ride might be a good one to look at. Thx for your quick reply. My physiotherapist did make an insole to correct my foot position, to avoid injuries. I tend to get a lot of calf tightening when I run. Would these shoes be good for helping with that? Hard to say, what shoe do you wear now? I was wearing Nike’s. I did go out and buy a pair of these and am thrilled to report that it has helped a lot. I am new to running and these shoes have made a big differenc for me. Looking forward to hearing about the GoRun 3. I’d love to give these shoes a try but I can’t find either version 2 or 3 available in a 12.5. Does Skechers not do half sizes above 12? Would love to try this shoe, but can’t buy it in my size! Scratch my other comment – appears you’re right, can’t find a 12.5 listed on most sites. Skechers has it as an option, but not in stock. Does Skechers make a shoe for me? I’m basically looking for a neutral trainer. Used to wear mostly Nikes (Vomero & Pegasus). Currently running in Brooks Glycerin and Asics Nimbus. Like both of those more than the Nikes. 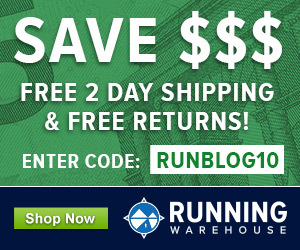 Mostly looking for a good cushioned shoe for everyday training. Mileage is low right now. Usually run about 55-60 miles a week on a mix of city streets and trails, but running has been very limited to past year due to non-running injuries (major surgery followed by 2 broken ribs from a fall), so right now I’m running about four days a week 4 miles a so a day. Building back up to at least an hour a day six days a week. Closest thing right now might be the GoRun Ride, but next year the shoe to watch for will be the GoMeb Strada. It was basically built to fill the niche you are looking for. A Gorun 3 review would be interesting. I’m a new-ish runner. I got on this boat late and got a pair of 3’s. Because they felt so comfortable inside I tried them barefoot but that led to blisters on the sides of both feet right behind the ball joint of my big toes. There’s a material overlap that feels totally benign but turned into a saw blade on me after only 2K. I can feel it with socks on too but with no adverse affects other than the distraction. I also thought the 3’s were way softer than the Kinvara 4’s they replaced. I feel like they were sapping my power and I attribute my never-had-before knee pains to the shoe being too unstable underfoot. Other than that I was ok with the soles mid foot bump. Lastly I thought they were hot – although there’s mesh over the toes 2/3rds of upper is a bit thicker and definitely doesn’t pass air as well. Don’t get me wrong, I liked trying these out (they’re cheap – why not?) because it helped me identify what I really like ( I guess I’m a firm shoe guy?) and don’t like in my shoes, but based on my knee experience I can’t recommend them.